If you’re an office worker, trying to juggle work with staying healthy and fit can be next to impossible. Between working on the computer for hours on end, attending meetings, to often just a short lunch break in between, who has the time to worry about this minor thing called “health” while you’re working? Well, the fact is, these are all just excuses. It is possible to work and stay active and healthy at the same time. Here are 6 of my favorite apps you should install that make the whole process seem almost easy. Let’s get started. #1. A stretch library, which includes hundreds of stretches that aim at all areas of the body. Instead of reading a blog post on hand exercises for example, get step by step instructions on various different ergonomic exercises that’s a lot easier to follow. All stretches also have detailed drawings and instructions. A timer is included for each stretch so you don’t run over or under! You have the ability to choose between single or groups of stretches for maximum benefit. The app teaches you to set up your desk, chair, mouse, computer monitor and/or laptop, and keyboard. They also offer quick tips for the best setup! All the details provided are supported by the Occupational Safety and Health Administration (OSHA). 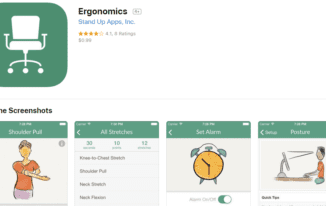 The app gives customizable reminders to get up and move! 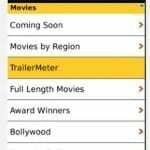 There is a nominal fee of $0.99 to download the app, and it’s available for iOS here. Americans spend on average over 10 hours a day staring at some sort of electronic device, according to a recent survey by Nielson. All this puts tremendous pressure on our eyes, leading to digital eye strain, fatigue, headaches, and even early macular degeneration from the blue light emitted by electronic screens. One of the best ways to rest your eyes periodically is to employ the 20-20-20 rule. Developed by doctors, the idea is very simple: every 20 minutes, look outside 20 feet into the distant for 20 seconds. 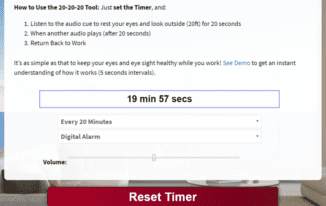 Use this free 20-20-20 Eye App to easily remind you to do that in the background as you go about your work. Exclusively for Google Play and Android users, Desk Job – Office Health is a great app for setting up daily workout reminders. What’s most interesting about this app, though, is your ability to time both your workouts and your rest periods, instead of simply one or the other like most conventional apps. The app includes a workout library with over 70 stretches and strengthening routines to make sure that your muscles do not atrophy in the hours spent sitting at your desk. It even makes suggestions for you, based upon your profile and other search criteria. Each stretch includes a quick how-to description, a brilliant image on how to perform the stretch and/or strengthening exercise, and the appropriate time to perform it. 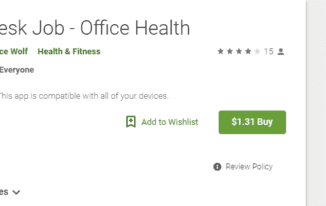 The “Desk Job- Office Health” app costs $0.99, and is available on Android and iOS. Do you have seven minutes? Everyone can find seven minutes! That’s the entire basis of this handy workout application. All workouts are formatted in a high intensity circuit training (HICT) format, ensuring that you’re getting the most bang for your seven minute buck. All workouts consist of twelve exercises each performed for thirty seconds, with ten second breaks in between each exercise. What’s even better is that there’s no equipment needed: a simple chair and a wall will do! 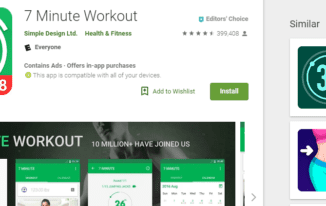 The “7 Minute Workout” app is FREE, and is available on Android. Have you ever been in a position where you literally cannot stand to workout? There are many people, including those that are obese, elderly, or injured, who cannot perform even the most basic of exercise because they have difficulty standing. SitFit, however, changes that idea. You can work at your own pace and from the comfort of whatever chair is your favorite — including your office chair! Each routine centers around three target exercises that help to rejuvenate your muscles without even standing — which is perfect when you’re metaphorically chained to your desk all day but haven’t been able to feel your legs since lunch. In addition, each routine includes a warm-up, exercise, and cool down to ensure that your muscles are properly primped and primed for exercise. The app, though, is a mere taste of what Sitfit is all about. They also have a link to their entire SitFit DVD, which goes more in-depth around chair-focused exercise. 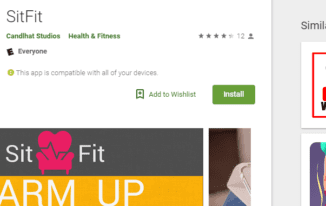 The “Sit Fit” app if FREE, and is available on Android and iOS. Pressed for time? We got you. 10 Minute Daily Yoga is the no-excuse Android app to make sure you get your daily movement in, and sometimes more than once a day! The app includes 30 beginner yoga moves, which are held for twenty seconds apiece with a ten second rest in between poses. There is also no equipment necessary — a simple mat, or even your office floor, will do! Gentle reminders when it’s time to stretch! 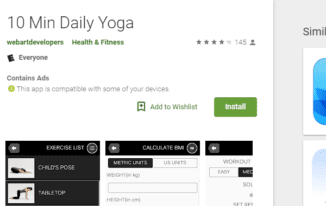 The “10 Minute Daily Yoga” app is FREE, and is available on Android. By modifying your workspace and allocating just a few minutes a day at work, you can dramatically improve your posture, alertness, productivity, and yes, health, while you work. All it takes is some will power, and a little help from modern technology.